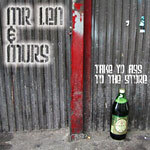 Murs teams up with Mr. Len for a bangin' single that'll have you reciting the chorus after the first verse! You get the cut + instrumental. Open copy, played once or twice in our store. Near mint condition. Original cover as shown. Still has shrink wrap (opened).